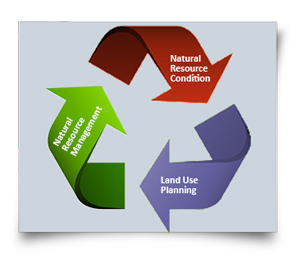 Successful land use planning identifies the needs of the community while safeguarding natural resources. It occurs at multiple scales, from property planning through to local government area planning, regional planning and state-wide planning. Our region covers an area of approximately 146,000km2 and includes part or all of 12 local government areas, each with its own local planning scheme. The major urban centres are located at Townsville, Charters Towers, Ayr, Home Hill and Bowen, however, the majority of our region is rural and supports a productive agricultural industry. Grazing occurs mostly in the rangelands, dryland cropping is widespread in the Belyando-Suttor and Bowen-Broken sub-catchments, and irrigated sugarcane production and horticulture occurs in coastal areas (Department of Agricultural and Fisheries, 2013b) (see Figure 8). Native forest on state lands also occur in our region and are either for forestry, recreation and/or quarry material, including sand, gravel, road base, crushed aggregate and landscaping rock. The landscapes of our region also support a substantial mining industry, which produces coal, gold, silver and copper. There are about 330 granted mining leases in our region. Mining operations over the last 150 years have left a legacy of impacts and risks associated with around 2472 abandoned mine sites in our region (Department of Agricultural and Fisheries, 2013a), (Queensland Department of Natural Resources and Mines, 2015). 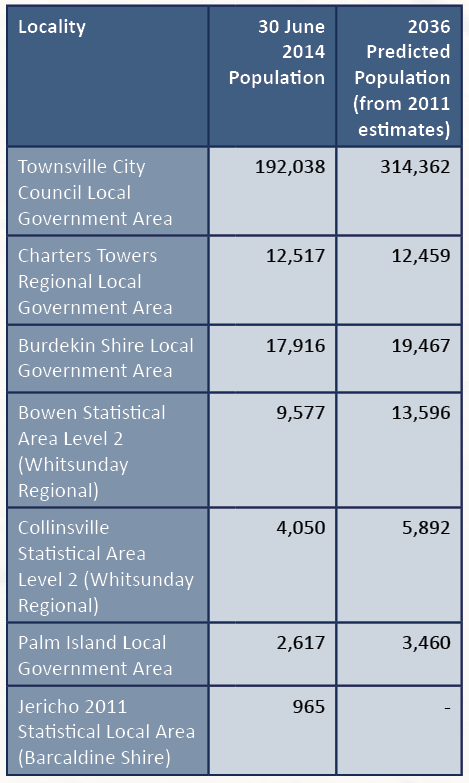 The Queensland Statistician’s Office has predicted a regional population growth of approximately 50 per cent over the next 20 years. See table below. As urban areas and services expand, they will encroach into rural lands and natural environments. Sections of the rural community have expressed a desire to expand intensive agricultural development throughout the region, particularly surrounding Ayr/Home Hill, Pentland, Belyando/Suttor (via water harvesting), Urannah and Collinsville. The Burdekin Falls Dam provides unique opportunities to accommodate agricultural expansion and diversification, however, it also has a number of high-profile constraints around the allocation of water resources and downstream impacts, including the GBR catchment (Refer to Water – Future Water Demands). Land-use planning decisions need to consider and balance multiple interests, including the land’s attributes, landscape and catchment context, government policies and community views. 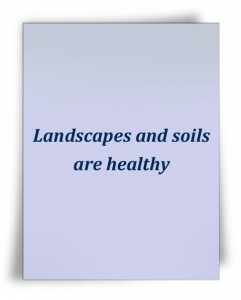 Development and expansion of urban areas and intensive agriculture should occur within the environmental parameters for the land and surrounding environment, and maintain soil health and water quality. In our region, we have a significant responsibility to reduce catchment impacts, in particular to improve water quality run-off from agricultural and urban development, to protect the GBR (Great Barrier Reef Marine Park Authority, 2014). 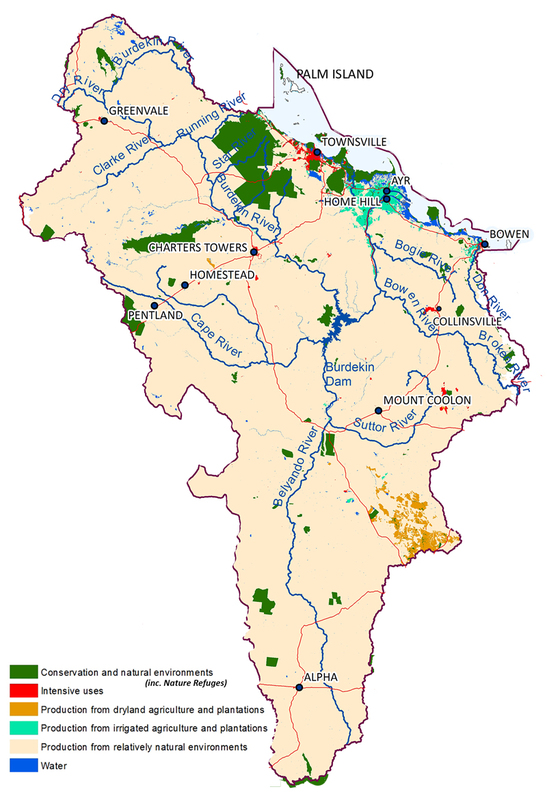 Improved land development, innovation and best management practice techniques can provide opportunities for expansion to occur that contributes to long term sustainability for our community, industry and natural resources; for example, on-farm water management, efficient and targeted pesticide application technology and providing habitat corridors and sufficient distance between development and natural areas to maintain biodiversity and natural processes (eg coastal erosion). 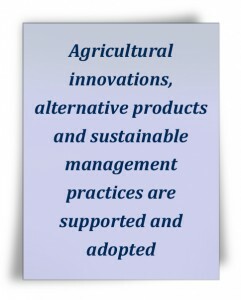 Further research and development, along with investment in new technologies, is vital to maintain a sustainable agricultural industry which can still deliver the required economic, social and environment benefits, including protecting the resilience of the GBR. Appropriate waste management and planning, including sewage treatment and future land fill needs, are also vital to reduce the health impacts on the public and the receiving environments (Department of Environment and Heritage Protection, 2014). See Water section for more regional information regarding waste treatment and Biodiversity section for littering and illegal dumping. 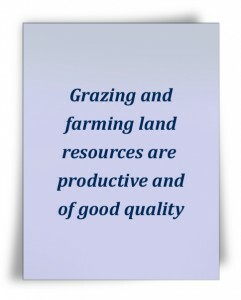 Impacts resulting from land use can also come from further afield. Urban areas and major transport corridors increase the frequency of movement of people, animals and materials and increases the risk of introducing pests and diseases. This also occurs when urban and peri-urban (rural residential) areas encroach into rural lands. In urban environments, pests and diseases are mostly considered health issues, however, they are major threats that can migrate to adjacent rural and agricultural land where they can create ongoing pest management problems and have significant impacts on people’s businesses and the natural environment (Wadsworth & Choy, 2011). Rural land managers adjoining reserves or major watercourses have expressed concern about trespassers who drop litter, potentially spread weed seeds, contribute to land and riparian degradation, and compromise livestock welfare. They have linked the issue with a lack of well-managed natural recreational areas in our region that provide urban people with the opportunity to recreate, including camping and four wheel driving. 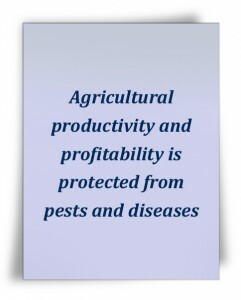 Further information on biosecurity is detailed in Biodiversity section. 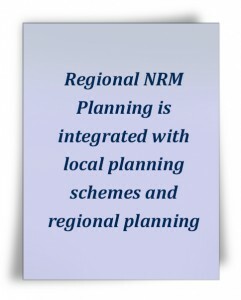 This community NRM plan can be used as a guide by decision makers and community members to help balance competing interests when undertaking land use planning assessments.